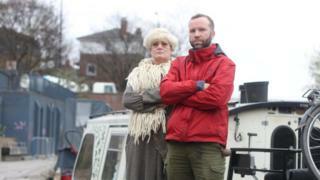 People living on boats in London have accused the authority managing Britain's waterways of "trying to force them off the water to make money". The Canal and River Trust (CRT) has proposed to restrict some of the capital's mooring spaces and start charging for others. Boaters fear they will be "priced out of" certain areas as a result. The CRT said it has to cope with rising numbers of boats and will use the extra funds for improving services. With London home to the highest average property prices in the UK and soaring rents, life on the water has continued to grow in popularity in recent years. The number of boats in the capital rose from 2,326 in 2012 to 4,001 in 2017 - representing a 72% increase, which compares to a modest national rise of 3%. Of those, the number of boaters without home mooring more than doubled from 638 in 2012 to 1,880 in 2017. Boaters who have a CRT-issued continuous cruising licence - rather than a home mooring - can moor for free in most places as long as they move every 14 days. Home moorings can be hard to come by - the CRT currently has just five on offer in and around London - and can cost up to £12,000 a year. The CRT's Draft London Mooring Strategy proposes to reduce the maximum stay from 14 days to two days or a week in some central locations, and create commercial moorings for paying businesses, as well as new pre-bookable chargeable moorings. Marcus Trower, chairman of the National Bargee Travellers Association London, which represents continuous cruisers, said the strategy had the "perfect recipe for gentrification: Turning places into business zones where we wouldn't be allowed to moor and reducing mooring times to encourage leisure cruisers rather than people who live on boats". He added: "The CRT is trying to force us off the water and turn the waterways into a money-making business." The trust said this was "absolutely not" its intention, and that London's increasingly busy water space had to be managed fairly to avoid "chaos". Continuous cruiser Oliver Hewett, 36, said: "It feels like CRT is pricing us out" but admitted the trust was "not in an easy position". The CRT, he said "would almost be remiss in its job to not be looking to price some of us out to get more business and tourism onto the waterways because you make a lot more money out of that than continuous cruisers". A continuous cruising licence costs between £500 and £1,000 a year, whereas commercial licences can cost up to £3,000. Seasoned boater Helen Brice, 51, said the proposals were a "way of sending continuous cruisers off the water" and make their life "as difficult as possible". Thea Smith, 31, another continuous cruiser, said the current strategy shows "the waterways are on a trajectory of gentrification and it makes me sad". The strategy proposes about 30 commercial berths in areas such as Little Venice, Paddington Basin, the Queen Elizabeth Olympic Park and Docklands. One boater - who did want to be named - said those berths will no longer be "for everyone" and "if the proposals go through, there will be a substantial reduction in 14-day spaces in central London". He added: "It will be harder to live on a boat and cruise through the city and people with money will benefit". The CRT said "some of" the proposed commercial moorings were in places not currently available for continuous cruisers, "so the impact on 14-day mooring space will be minimal and the income generated by business boats helps us generate additional income to maintain the waterways benefiting all boaters". The strategy also proposes new short-term pre-bookable payable moorings. The trust said these would be in places where mooring is not currently available and thus "transform unused spaces into places to moor". While unable to provide "specifics", the CRT said it was "not talking about any large scale reduction of 14-day mooring spaces". The draft strategy also plans for more facilities - a step welcomed by boaters. The trust said in a statement: "Overall we are aiming to make life better and fairer for every type of boater - including those who choose to live on their boats. "There has been a massive increase in boats in London, causing pressure on space and facilities. We have to manage the space fairly for all boaters - if we didn't there would be chaos. "In many cases the proposals will improve life for live-aboard boaters, creating more places to get water, empty toilets and dispose of rubbish. "About 89% of the 100 miles of waterways in the London area is moorable, and boaters can moor at the vast majority of spots for 14 days. We do need to make sure that in the busiest places the space is shared fairly between all boaters. "This is a consultation so we are asking everyone who boats in London to let us know their thoughts." The consultation closes on Monday, 18 December.